Come visit the PTMSC when we "daylight" the gray whale bones on the Pier for a long dose of sun and warmth. For this one-day-only event, staff and volunteers will be on hand to answer questions about gray whales, how this one came to be part of the PTMSC collection, and what we can learn from marine mammals in our midst. You can also learn more about the Marine Mammal Stranding Network at work right here in Port Townsend. 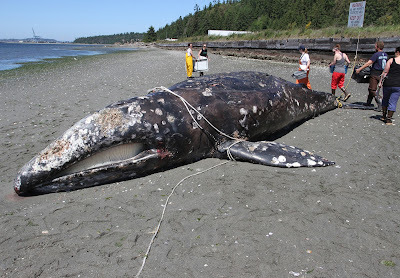 In May of 2016, a juvenile gray whale died in Elliott Bay in Seattle and was towed to a site on Indian Island provided by the US Navy. A team of volunteers, staff, and AmeriCorps members assisted with the necropsy and additional preparation of the body for preservation of her skeleton. The PTMSC has been storing the skeleton until it can be articulated for use in educational programs and exhibits.